From the light vinaigrette for the mixed side salad to the hearty potato salad for the barbecue - hardly any dressing comes without vinegar and oil. Whether in combination with mustard, lime, salt and pepper or simply - with these two ingredients you can easily conjure the most delicious sauces. But not only salad dressings, also meat dishes, stews, bread spreads and even desserts can be spiced up with the two classics. One thing is certain: Vinegar and oil must not be missing in any household. In the high-quality oil and vinegar bottles, you will not only refine the various dishes, but also the look of the kitchen or the dining room. Stylishly placed on the design dining table or the kitchen shelf, the sets ensure a harmonious ambience and serve as shapely home accessories. Thanks to practical pouring or atomizing attachments, vinegar and oil can be portioned wonderfully. Always at hand, you can refine your meals to your taste at any time - convince yourself! 2. Material of Oil & Vinegar Bottles: Plastic, Glass & Co. Renowned manufacturers such as Eva Solo and Alessi produce oil and vinegar bottles - from classic, simple to striking and original - in various designs. However, they all have one thing in common: They remove the usual vinegar and oil bottles, which are often bulky and disturb the uniform and elegant appearance of the interior through their imprints. Here you can find out which advantages the respective designs offer and which model best suits you. Vinegar & Oil Set: Classic containers with a pouring spout, which allows easy portioning and precisely finish the flow after use, are the most common way to bring vinegar and oil to the table. The shape of the dispensers varies from flask over to a carafe to a stalactite. The casting attachment is not only functional, but also gives the models their individual optics thanks to a variety of materials and shapes. Many oil and vinegar bottles are part of a whole kitchenware collection and therefore can easily be combined with other pieces. In addition to the noble Eva Solo carafe for vinegar and oil, for example, the manufacturer produces a suitable carafe for drinks. Whether it is a relaxed dinner with your family or a big birthday dinner, you will love the detail and perfect your table decoration. Two oil and vinegar dispensers on the dining table immediately create a cozy as well as elegant atmosphere - This increases the feel-good factor. Salad Dressing Dispensers: Do you like to experiment and try out new recipes? Then a dressing shaker is the right choice for you. Vinegar, oil, lemon and herbs, shake and the delicious vinaigrette is finished. You are the chef. Just add your favorite ingredients into the dressing shaker and shake up your perfect dressing. The salad dressing dispenser can then be placed elegantly on the table - so anyone can access it at will. Vinegar & Oil Sprayer: You can use a sprayer to spray a fine "oil and vinegar mist". So you distribute oil and vinegar evenly and avoid overdosing. Thanks to the filter system, you can also add fresh herbs to the oil which gives it its own refined taste. This improves not only the taste, but makes also for a great visual effect. 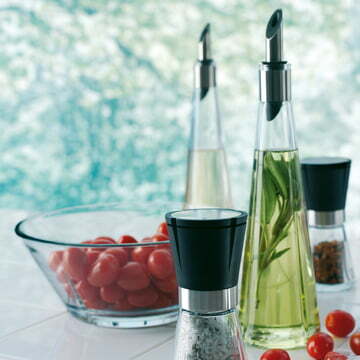 Classic oil and vinegar bottles and salad dressing dispensers made of glass look particularly high-quality and elegant. They provide a clear view of the content so you can immediately see if there is salad dressing, oil or vinegar in the container. The material fits subtly in every interior. Models made of plastic have optical properties similar to glass, but are lighter and more resistant. Stainless steel vinegar and oil sets are modern, original and fit perfectly into industrial design. The opaque material protects oil and vinegar from light and oxygen, thus avoiding oxidation and preserving the aroma for a long time. 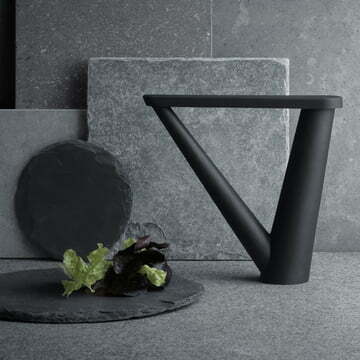 The Aldo Bakker Oil Dispenser from Georg Jensen made of matt black cast steel is a sculptural highlight in your kitchen and dining room. The interesting shape is ideally matched to the consistency of oil and vinegar. Whether glass, plastic or steel - all vinegar and oil dispensers are easy to maintain and can be cleaned by hand with a little washing-up liquid under warm water. Some models are even dishwasher safe - saving you even more time cleaning. You will find more detailed information on the material and the care of your favorites on the respective product pages. Design oil and vinegar bottles and salad dressing dispensers are available in various sizes. Before buying, think of how much your vinegar and oil consumption is in general, and if the dispenser should be the center of the kitchen or dining room. Small dispensers with a height between 10 and 14 centimeters can be placed particularly discreetly and space-saving on the dining table. However, they have a relatively low capacity and have to be refilled more often. Medium sized models with a height between 15 and 20 cm absorb approximately 0.2 liters of liquid. In the larger containers you can add fresh herbs, chilli or the like. With a height of just under 30 cm and a capacity of 0.28 liters, the Peter Zumthor Oil and Vinegar Bottle - part of Alessi's Officina collection - always makes a great impression in the kitchen and the dining area. Large vinegar & oil dispensers are particularly suitable when you invite guests to eat. The design pieces ensure that there is always enough salad dressing on the table. At the same time they serve as an original decoration element, which can be supplemented with accessories from the same series. Vinegar and oil are true all-rounders. Whether in dressings for salads, for marinating different chicken dishes or for fruity desserts - your imagination is the limit. And that is not just in the kitchen. Diluted with water, vinegar can be used as an environmentally friendly cleaner all over the house. Cooking oils such as olive oil are ideal for caring for dry skin and hair, for alleviating ear pain or for removing stubborn labels completely. This makes it all the more important that vinegar and oil are stored in the apartment in an attractive and handy manner. To keep the flavor of the products as long as possible, store the oil and vinegar bottles in relatively dark and cool rooms and protect them from direct light. If you don't use much vinegar and oil, a dispenser made of opaque stainless steel is recommended. You will get cheap dispensers for vinegar, oil and dressing between 15 and 25 €. One example is the Dressing Shaker made by Rig-Tig by Stelton. In the middle price segment, between 30 and 70 €, you can find design pieces from well-known manufacturers such as Eva Solo and Rosendahl. Particularly exclusive and original items can be found in the higher price category - be sure to find the right product for every wallet here on Connox! Feel free to browse through the design shop and discover our assortment of oil and vinegar bottles as well salad dressing dispensers that suit you and your requirements! You want to buy a designer vinegar & oil dispenser online, but need support? Please feel free to contact our customer service. We help you if you have any problems with your purchase, give recommendations and we can quickly clarify questions. Let us send you your favorite product to your home, comfortably within a few working days!